Mareanie is a starfish-like Pokémon with a purple stalk-like body and ten drooping tentacles that resembles hair. It has a blue and purple color scheme, and what appears to be a gloomy expression. It has three teeth and blue eyes with yellow sclera and pupils. Each tentacle has three spines, except the one above its face, which is shorter than the others and has only two. 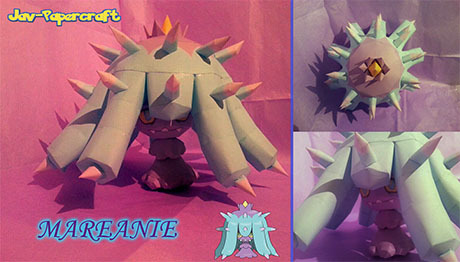 Papercraft created by Javierini and assembled by Pikachitoo from Jav-Papercraft.